More often than said, HIV is one of the topics that I keep coming back to blog about. The hallmark ability of HIV virus, that has baffled and trimmed our ability to fight HIV is the ability of HIV to integrate stably into the host genome. Though there are some new strategies that are specifically designed to attack the HIV such as ZFN (Zinc finger nuclease) based proviral attack and bnAb (Link), most of the research is still focused on understanding the HIV latency. The promise of vorinostat (Link), to attack the latency has brought in certain revived interest in the old strategy. This blog post concentrates on the basic biology of HIV latency. The term "HIV latency" was first used to describe, the clinical long asymptomatic period initial infection and the development of AIDS. The term is often misleading, since it is known that the HIV replication occurs throughout the course of infection. However, HIV can also be present in dormant condition, as integrated DNA in T cells. For all the discussion purpose, HIV dormancy is referred here as latency. HIV readily infects active T cells and destroys most of them via cytopathic effect or host immune response. However, a small subset of cells that return to resting state and become memory cells harbor the virus have latent genomes. The HIV genome expression in its initial stages is dependent on the cellular activity and NF-kB activity. This latency makes it impossible to attack the virus through anti-retrovirals or immune system.Classically, HIV resides in dormant T cells. However, it also resides in macrophages and dendritic cells (DCs). The cellular latency can be defined under two broad groups- Pre-integration latency, which represents a block in viral life cycle and Post-integration latency where the proviral genome is reversibly silenced after integration into the host cell genome. Pre- integration latency is often used as a surrogate marker for recent infection, and doesn't correlate well with the clinical symptoms. Often in literature, Post integration latency is simply stated as latency. Though latency is a multi-factorial phenomenon, the mechanisms cited as the common causes of latency includes- Chromatin remodeling and DNA methylation. Chromatin remodeling involves more of a cellular based approach. Though DNA methylation (epigenetic modification) is controlled by the host cell, the HIV can remove or add the methyl group at will and hence is more a virus mediated latency control. 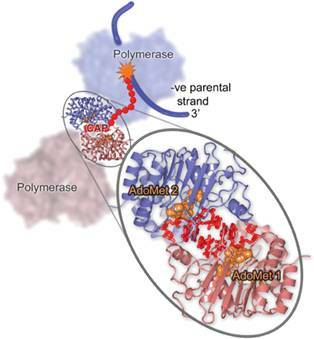 Chromatin remodeling mechanisms include- SWI/SNF remodeling and post translational remodeling (Acetylation, Methylation, Ubiqutination, Phosphorylation and SUMOylation). Each individual mechanism has its own value. Perhaps, of all these the most studied is the role of HDACs (Histone deacetylase). HDAC-1 is activated by HIV LTR (Long terminal repeats), and efficiently interacts with multiple DNA binding proteins with subsequent effects. The use of Vorinostat or valporic acid (inhibitors of HDAC), causes effective remodeling of Nuc-1 and enhances the viral transcription, overcoming latency which can then be attacked. One of the best cellular combat method to suppress a genetic information is by methylation of specific DNA sequences. DNA methylation is known to suppress the promoter activity of the HIV-1 LTR. However, The demethylation signals at 5’-LTR can induced by the TNF-α, thus posing no problem to the HIV expression, since this can be achieved at will. A recent paper published in BMC- Retrovirology by Sherrill-Mix et al, compared chromosomal environment of integrated proviruses has been proposed to influence HIV latency based on five different in vitro models of latency based on primary human T cells. The studied showed that probably the site of DNA integration (which differs in different cell systems authors studied) dictates the mode of molecular latency. Dengue Virus (DENV) is a Flavivirus member, transmitted by mosquito (Aedes species) bite. There are 4 serotypes named from DENV 1- 4. Many variants exist within serotypes owing to high mutation rates of virus. All of them are associated with clinically significant infections, with very little cross protection. 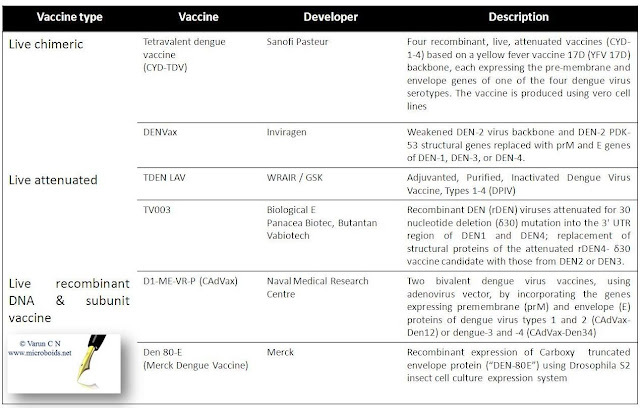 As with other infectious diseases, vaccine hunt is on for dengue (Visit Dengue vaccine initiative for details; Link). More recent studies have been indicative of growing incidence of infection, and thus has become a international vaccine priority. Multiple different companies and scientists have vested their interests in developing vaccine of which many have entered clinical trials. A list of successful candidate vaccines are aggregated in Table 1. 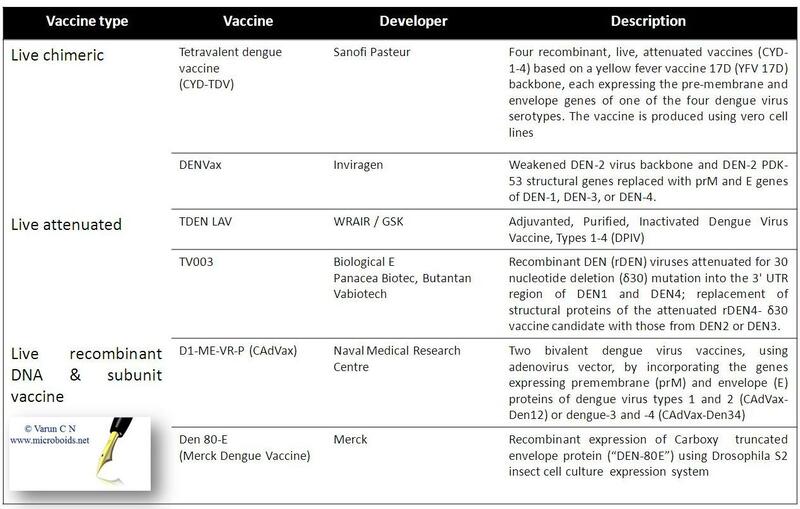 Table 1: Various dengue vaccines under investigation and clinical trials. Of the seven Non structural proteins that the gene code, NS5 is a multifunctional protein, with the RNA-dependent RNA polymerase and methyltransferase (MTase) activities, responsible for RNA cap formation. Capping of RNA is an important process, (as the readers may know) is a hall mark of eukaryotic RNA. A lack of RNA cap is usually identified by the cellular immune process. That sums up to say that MTase (also known as 2'-O-methyltransferase) is responsible for escaping cellular immune detection. Moreover, it has been shown earlier that NS5 can stimulate the production of IL-8. IL-8, is a proinflammatory CXC chemokine, which induces a respiratory burst, and can counteract the antiviral effects of IFN-α and thus enhance viral replication of many viruses. The DENV-2 NS5 methyltransferase has an N-terminal subdomain, a core subdomain, a C-terminal subdomain, a K-D-K-E motif, and a "S-adenosyl methionine-dependent methyltransferase fold" structure which is essentially a "sandwich" of αβα sheets in the N-terminal domain. The N-terminal domain has the capacity to bind GTP, hold the guanosine of the viral cap structure, and synthesize two different methylation reactions that are required for the formation of the RNA cap. A GTP-binding site in the N-terminal domain is suggested to be a cap-binding site for the Dengue-2-methyltransferase. The C-terminal subdomain is an RNA-dependent-RNA polymerase (RdRp) domain. The core subunit is responsible for Ado-Met binding and catalytic activity due to the GTP-binding pocket. Taken from Massana etal. The above detail forms the basis of the new vaccine design approach by Zust etal. The researchers created MTase mutants containing Ala-substitutions at the K-D-K-E tetrad motif (2 types, E217A and K61A+E217A). They then grew the virus in BHK21 cell lines. The mutants still retained polymerase activity and hence could reproduce. This provided a stable MTase mutant virus. The same mutation was introduced in all the 4 serotypes. These new virus were able to infect the animal models actively but were very weak, since they lacked the support of MTase. Moreover, lack of MTase allowed immune detection, and hence develop immunity. So when the animal was challenged with wild virus, it conferred a good protection. An added advantage of this study was to show that these mutants were incompetent in infecting the mosquito. This study is a proof of concept experiment that the MTase mutant DENV can be used safely and provide a good immune protection. A tetravalent formulation with same attenuating mutation in all four serotype recombinant vaccine strains, presents with difficult conditions of reversion via recombination. The authors also report that they couldn't see the problem of ADE (Antibody-dependent enhancement of infection), which is otherwise a problem attributed to failure of many earlier vaccine studies. The study has got us new insights and hopefully will be entering to clinical trials soon. Cancer is one of the most scary term in the field of medicine. Considering the most happening in medical research, the most researched upon topic includes- Oncology, Stem cells, infectious diseases and vaccines. That is because Oncology is of great interest to pharma industries round the world as one of the most promising viable business. Wait a minute, Wasn't I supposed to post only about the stories pertaining with microbes? Well, Oncolotyic viruses as possible therapeutics has been fairly a new realm of molecular medicine. Fig 2: Construction of the H101 oncolytic virus. Fig 3: Mechanism of H101 oncolytic action. Cancer immunity cycle (Review by Mellman etal; 2013) depicts the generation of immunity to cancer as a cyclic process that is self propagating. Activation of effector T cells by tumor cells lead to immune response and subsequent infiltration. The killing of cells leads to release of more tumor antigens and cycle continues. A resistance to this conferred by antigenic drifting of neoplastic cell via a process called as Immune- editing. With this idea it seems legitimate to ask, if a tumor cell can be lysed by using a oncolytic virus can it trigger the cancer immunity cycle? Think about it. 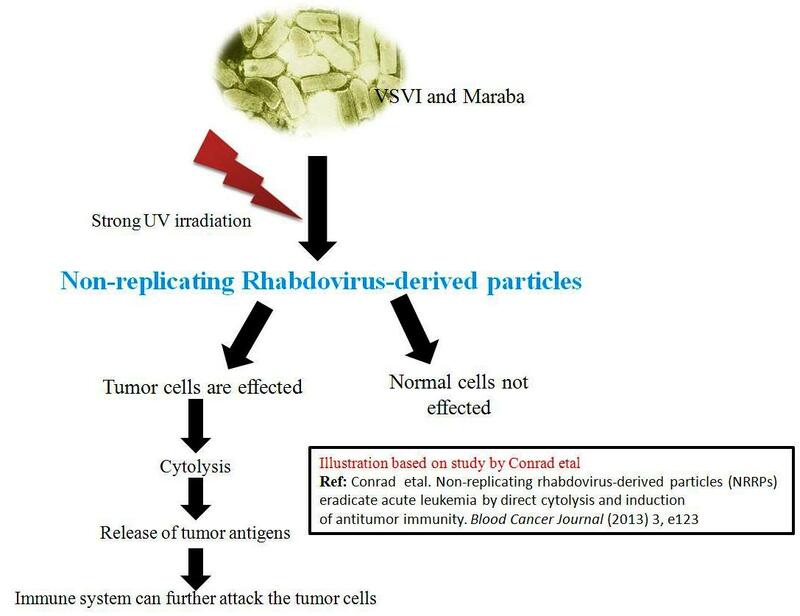 2 Rhabdoviruses- Vesicular stomatitis virus (VSV) and Maraba, are explored and tested as potential anti-cancer materials. In its wild form these viruses may represent potential danger, and hence are genetically modified to attack only tumor cells. Moreover, they represent a weakened form of virus which cannot attack normal healthy host cells. In contrast cancerous cells have altered metabolism and impaired antiviral activity. Such specific viral materials can be derived by culturing in cancerous cell lines. The study by Batenchuk et al (Ottawa Hospital Research Institute), postulated that if you can create a non replicating viral particle with sufficient immunogenic and oncolytic activity the difficulty of dealing with safety can be overcome. For this study, Indiana Serotype of VSV (VSVI) and wild type Maraba virus was cultured in Vero cell medium. Using strong doses of UV light, biologically inert (in this case replication incompetence) viruses was harvested. Infectivity assays showed that it requires about 10 fold higher dose for the normal cells to be infected compared to cancerous cells. Fig 3: NRRP induces cytolytic and immunogenic activity. 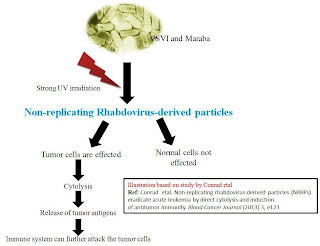 These NRRPs (Non-replicating rhabdovirus-derived particles), were now able to selectively deplete leukemic cells of various types including the cells received from patients which were non responsive to standard drugs. The mouse model studies were encouraging with almost 80% efficacy, and 60 % of mice showing a complete cure. In contrast all of the untreated mice died of their leukemia within 20 days. The study is of great interest as it represents the first study using a biologically inert virus and not a actively replicating type which bypass the problem related to safety. The study also establishes that NRRPs provide both cytolytic and potent immunogenic properties in multiple acute leukemia models. I have illustrated the concept graphically based on my understanding form the paper in Fig 3. I have a question here. If the virus is non replicating, what is the driving factor to kill the cell? Authors have hinted that the viral particle's presence induces a phenomenon called as immunogenic apoptosis. It is a host defense mechanism essential for antiviral immunity which commits the cell to apoptosis. That again begets a question. Tumor cells are usually mutated for multiple apoptotic pathways and so how exactly this functions? In this case i don't have a proper explanation. Maybe I should get back to some reading. This is not the only example of Oncolytic therapy against Blood cancers. For example, Reolysin ®, proprietary variant of the Reovirus (Respiratory Enteric Orphan Virus, Serotype 3 Dearing) produced by Oncolytics Biotech. This is used in combination with chemotherapy for treating multiple myeloma. Attenuated Sporozoites in Blood is Protective? Just a few blog posts ago, I had posted about Malaria. 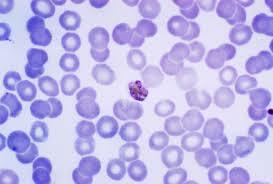 I ventured into various possible methods that can be looked into to control the Plasmodium infection. In the post, I mentioned of a vaccine candidate RTS,S/AS01 vaccine (Reference). I also expressed issues of very low efficacy as a concern. But a recent paper published in Science, has claimed a 100% protection. Which means I really need to talk about it. Before you go through this, I would suggest that you have a background reading from my previous post. Vaccination has been a fantastic tool of medicine (in situations where it can be applied). The lack of an excellent vaccine against the Plasmodium species, especially P vivax and P falciparum, is reflected in the global burden of the disease. The disease usually seen in tropics has mounted a great deal of science and challenge. The best known of the malaria vaccines is RTS,S/AS01 vaccine, pursued by GSK targeting the CSP (Circumsporozoite protein) showed a great promise. But eventually in follow up studies it failed to demonstrate expected levels of protection (which was less than 40%). Though the study hasn't concluded yet, and data collection is still on process the vaccine is considered as pretty much a failure by many. This stages a debate as to what can be the reason for vaccine failure with such good potential. One of the explanation was that probably Plasmodium never produces a long lasting immunity (there are other examples of similar candidates), and hence the RTS,S/AS01 (Mosquirix) still be considered. Perhaps we should think otherwise. This study is a phase 1clinical trial (Safety study), of Sanaria ® PfSPZ Vaccine, primarily funded by the National Institute of Allergy and Infectious Diseases (NIAID), National Institutes of Health (NIH) with additional support from the Naval Medical Research Center and Sanaria. The vaccine material is sporozoite recovered from the salivary glands of mosquito that has been purified, cryopreserved. They were radio treated and attenuated. These attenuated sporozoite now referred as PfSPZ, invade hepatoctyes and expresses new proteins, but cannot replicate. Studies earlier showed that it is safe and well-tolerated when administered ID or SC to volunteers, but sub-optimally immunogenic. So this new approach used intravenous route. The basis of this study has roots in some older studies. Inactivated sporozoites had been shown to be promising. It was later shown that CSP was immunologically important and clinical trials were conducted with a sporozoite vaccine called SPf66. Due to its low efficacy, it wasn't further pursued. A significant leap was made by Mueller AK, by identifying UIS3 (upregulated in infective sporozoites gene 3) gene, which when deleted showed inability to replicate in hepatocytes. Immunization with UIS3-deficient sporozoites showed complete protection against infectious sporozoite challenge in a rodent malaria model. This study involved 60 patients. Of the participants who received the mosquito challenge, 11 of 12 who were not vaccinated became infected, 16 of 17 in the lower vaccine dose groups became infected, and only 3 of 15 subjects in the high-dose vaccine groups became infected. None of the six subjects that received five doses were infected. The maximum dose that was given was 135,000 sporozoites. Please note 100% efficacy is with 5 iv doses. For me, the take home message is obvious. When Sporozoite is given through natural route (intravenous) of infection, with high load the immune system responds well. Probably we were looking in wrong direction. This vaccine will advance our knowledge on Plasmodium control, but am a bit skeptical. We had similar results with CSP and Phase I is just the start of it, not the final verdict. Moreover 5 heavy doses intravenous is a bit asking for too much especially in population of underdeveloped countries. Always a scope for improvement. Stephen L Hoffman. Adaptive clinical trials of three PfSPZ products for development of a whole sporozoite vaccine that prevents Plasmodium falciparum infection, disease and transmission. Malaria Journal 2012, 11(Suppl 1): O48. doi:10.1186/1475-2875-11-S1-O48. 4. C-type lectin receptors (CLRs). Imagine this scenario. A DNA virus (say for example HSV-1), has injected a genetic material into the cell. The most important event, from cellular immunological point of view is to sense the genetic material. DNA in cytoplasm is a definitive indicator of invasion, as DNA is not seen in the cytoplasm. This is in opposition to RNA where the cell has to make a distinction of self and non self. The point of this post is to look into how DNA is sensed leading to a long series of events. Table 1: proposed sensors for Cytosolic DNA. To begin with, there is a huge scarcity of studies that aim to understand DNA sensing in cells. DNA can be found in scenario's of Nuclear damage or viral invasion all of which signifies damage. 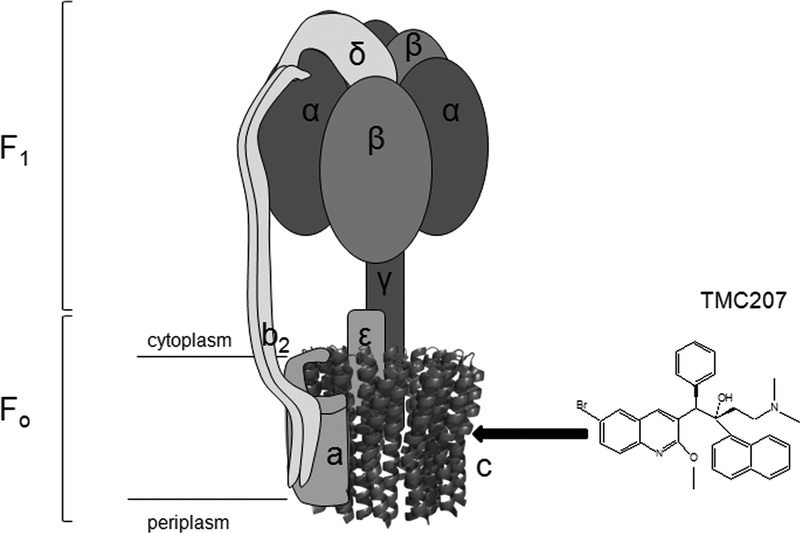 There are several receptors proposed as cytosolic DNA sensor. See table 1.The most recently discovered factor is cGAS. 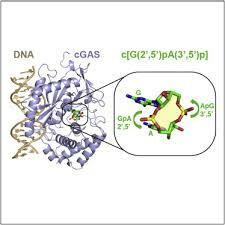 In this post am elaborating only on cGAS as DNA sensor. I want to digress here. Interferon's (Originally named so, for its ability to interfere with viral replication) are classified into 2 types based on the receptor specificity. Interferon type-I consists of all the interferon which are structurally related and bind to a common hetero-dimeric receptor IFNAR (Interferon-α/β receptor) consisting of two units- IFNAR1 and IFNAR2. Interferon type-II consist of a single entity IFNγ. 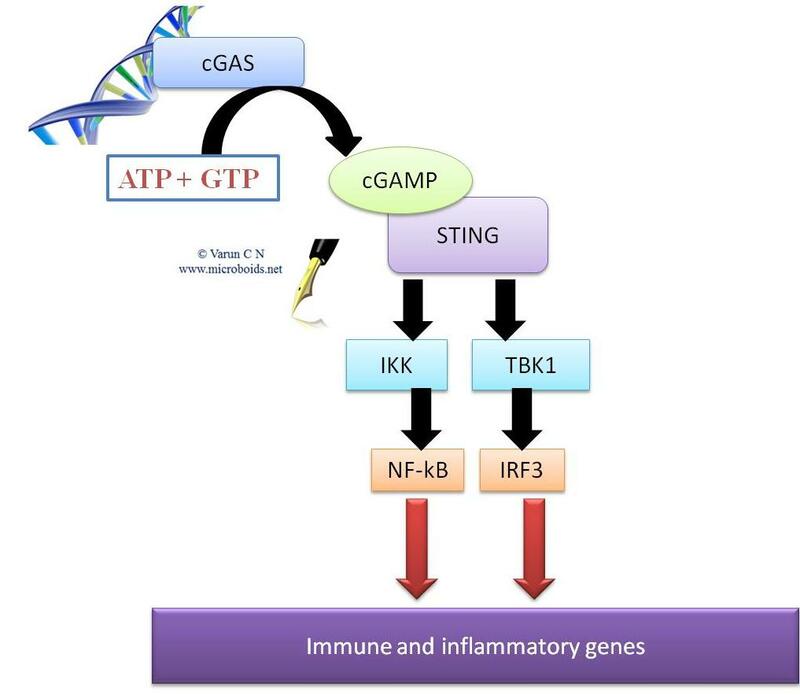 STING refers to "Simulator of Interferon genes". STING is involved in regulation and promotion Interferon type-I mediators.Structural analysis has shown that the STING can be bound by cyclic di-GMP (c-di-GMP), which is a bacterial secondary mesenger and a second messenger produced by bacteria, and cyclic GMP-AMP (cGAMP). STING is present in the endoplasmic reticulum. A very recent structural analysis shows that a very specific isomer of cGAMP, namely c[G(2',5') pA(3',5')p], was produced by cGAS. hSTING (Human STING) is composed of a N-terminal transmembrane domain (amino acid 1–154), a central globular domain (aa 155–341), and a C-terminal tail (aa 342–379). It has been shown convincingly that the STING opts a V-shaped conformation which allows binding of DNA ligand. The binding induces a conformational change in STING structure, thereby allowing access to active site which is a nucleotide-binding pocket. Looks like am back in the blog world. I was just browsing through my past posts in the blog. Roughly much of the posts has been on viruses specially HIV and Influenza, followed by some Bacteriology. But there is one Bacteriology topic that probably should have been given more importance in this platform. Want to make a guess? Am talking about the world renowned infection- Tuberculosis, simply known as TB. This probably is the right time to bring up this topic, since I have a couple of papers to discuss regarding this topic. As always, I had prefer to start of with some basic background introduction so as to bring the point as to what is important and then move on to the most important findings that is of relevance. 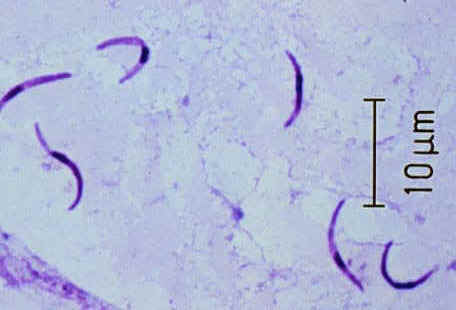 The infection is caused by Mycobacterium tuberculosis a member of Mycobacterium group. Unlike other bacterial infections, it is an exceptionally difficult to treat organism. Moreover traditional methods of diagnosis such as culture and biochemical analysis takes roughly 3-4 weeks, even in the best of the conditions. All thanks to the slow growing nature of the organism. 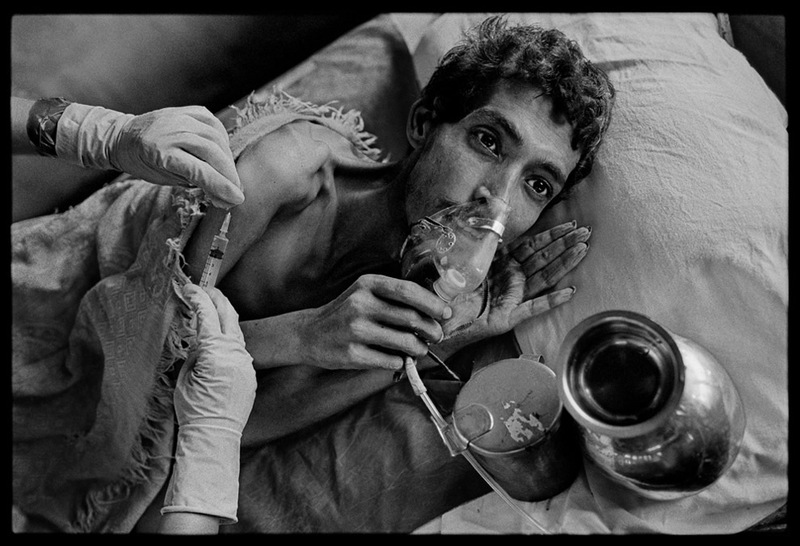 An estimated 8.7 million people fell ill with TB and 1.4 million died from TB in 2011. The Same source also reports that estimated 20 million lives are saved through use of DOTS and the Stop TB Strategy recommended by WHO. (Reference: WHO). There exists a very general idea of how an antibiotic should work (Considering all the class of Antimicrobial drugs). Antibiotic is most effective, if the organism is biochemically active. That means to say, it is very difficult to target drugs against a sluggish or completely inert lying organism. This exactly is the problem in treating several different infections like HIV (Dormant genome, proviral genome), Malaria (Hypnozoites of plasmodium) and of course TB (Absolutely sluggish biochemistry and replication). For starters that is a problem big enough to deal with. The primary line of recommended anti-TB drugs are Isoniazid, Rifampicin, Pyrazinamide, Ethambutol, and Streptomycin. See Table 1. First let me consider a best case scenario. A person suffering from cough for more than 2 weeks, is screened for TB by traditional methods such as Acid fast staining of sputum sample, or fluorescence method (such as Auramine O method). More advanced methods such as MGIT culture, luciferase assay, gene detection assays provide better diagnostic support. Newer immune based assays such as IGRA (Interferon Gamma release assay) have slowly replaced mantoux testing. Whatever be the case, once a patient is diagnosed of TB, the subject is involved in a WHO directed program referred as DOTS (Directly Observed Treatment, Short Course). More recently India has adopted DOTS+ strategy for combating MDR and XDR TB. With the best expected patient compliance, it takes almost 6 months to achieve full recovery. Worst case scenario, especially in countries like India, the patient compliance has been not to the mark. When the patient receives treatment, there is a reduction of bacterial load and reduction in symptoms. The patient often discontinues the drug (Assuming recovery, against medical advice), leading to emergence of drug resistant strains. The original treatment strategy involved treating for more than year. With introduction of Pyrazinamide, the treatment time reduced to 6 months (Pyrazinamide can attack semi dormant bacilli also), hence referred as short course treatment. There are 2 important problems in the area of TB treatment- MDR and XDR. Multidrug-resistant tuberculosis (MDR-TB) is defined as TB that is resistant to both Isoniazid and Rifampicin, two of the first-line drugs. Extensively drug-resistant TB (XDR TB) is resistant to Isoniazid and Rifampin, plus any fluoroquinolone and at least one of three injectable second-line drugs. The second line injectable drugs include kanamycin, amikacin, capreomycin. Then there is a more recently announced TDR TB, which is misnomer. As per WHO, TDR TB is improperly defined and still susceptible to few drugs (So resistance is not total, though its a superbug). So let us put it this way. Our ability to treat TB will depend on 4 factors- Short treatment duration, better patient compliance, New agents with novel mechanisms of action to ensure activity against MDR and XDR and a drug that can attack latent TB infection (LTBI). So what have we got in our armory? There is an alternative for INH- "Pyridomycin". It is produced by Dactylosporangium fulvum, and attacks NADH-dependent enoyl- (Acyl-Carrier-Protein) reductase InhA thereby inhibiting mycolic acid synthesis in M. tuberculosis. A huge advantage of this drug is that the clinical isolates that are resistant to INH are susceptible to pyridomycin. That provides one good alternative. But when I think of a novel compound against TB, am reminded of a compound called -TMC207 which was one of the first in pipeline. 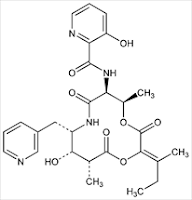 This is a diarylquinoline compound with a novel mechanism of action- "Inhibition of bacterial ATP synthase". In a study published in NEJM, showed great promise in TB treatment strategy. The mechanism of action is by inhibiting the bacterial ATP synthase, a critical enzyme in the synthesis of ATP for M. tuberculosis. Binding of TMC207 to the oligomeric and proteolipic subunit c of mycobacterial ATP synthase leads to inhibition of ATP synthesis. The gene coding for the c subunit (Link) is atpE with a very highly conserved sequence. A extremely conserved sequence represents difficulty to evolve and thus provides us with a beating advantage. A representation of TMC207 action is shown in Fig 2. One of the best things that the pharmaceutical companies do very well is to run a very large assay with all the chemicals they have in their chemical library. In doing so, they sometimes come up with a compound that have potential activity against a pathogen which could be of great help. That's what Pethe and his colleagues did. They screened more than 100,000 different chemical compound, of which 106 molecules killed the infectious agent without harming the cells. The best among them- imidazopyridine amide (IPA) was further tested and chemically modified to bring in a brand new chemical Q203. The compound was tested in a mouse model. The compound showed good efficacy, better than INH and was well tolerated at a higher dose. My immediate question is what is the mechanism of action. This drug also effects ATP synthesis, but at a different target- cytochrome bc1 complex. From the data that I could gather, Cytochrome bc1 complex looks pretty much conserved sequence. A little more of search told me that, this isn't a novel idea. There seems to be a race between many companies. In 2012, there are 2 publications that I could find, which did the same. Abrahams etal, reported Imidazo[1,2-a]pyridine (IP) compound as potential ATP synthesis inhibitor. In another study, Puiying etal identified some chemicals in imidazopyridines (thirteen compounds), Thiophene (one compound) and Benzimidazoles (Nine compounds) as potential ATP synthesis inhibitor. Both studies have zeroed in the compounds by screening a very large set of chemical library using high throughput assays. Claims are that the Q203 is superior to others. The point however is all of them have found Imidazopyridine based compounds as the molecule of interest. Probably time for someone to study the efficacy all the drugs together in one parallel study. Definitely, TB is a sluggish organism, but no organism can be sluggish when it comes to ATP synthesis and hence we have an upper hand in this case. The future of Anti- TB looks good. One of the first few posts, when I started blogging, was to write about antibiotics. I talked about use of halocins, targeting quorum sensing, attacking the cell replication machinery and toxin antitoxin system. Considering the field of infectious diseases a lot of study goes into studying antibiogram and spread of antibiotic resistance in several species. 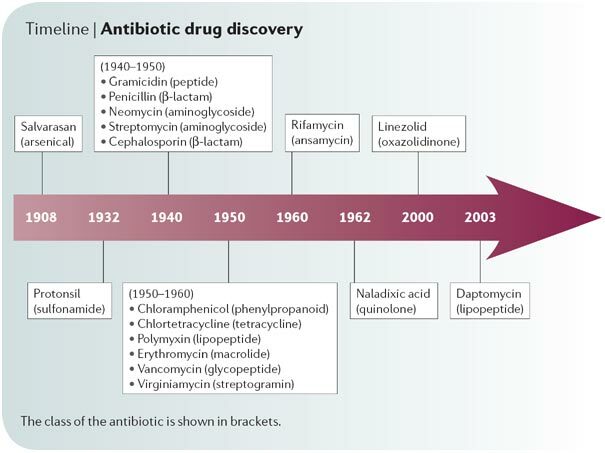 With more and more organism raising to the status of MDR (multi-drug resistance), XDR (Extremely drug resistant) and superbugs, we are short of antibiotics. To cite an example, MRSA (Methicillin resistant Staphylococcus aureus) is treated with vancomycin. resistance to vancomycin leaves the clinicians with almost no choice of drugs. Vancomycin was discovered as early as 1960's. The latest class of drugs like carbapenems and puromycins was discovered in 1980's. Practically, we have not discovered an antibiotic for more than 30 years (Daptomycin is an exclusion)!!! Fig 2: Mechanism of toxin antitoxin action. Now let me shift my focus of this blog post- Toxin antitoxin system. The system is a bi-component system. The two components include a toxin that has a long half life, and an antitoxin with a short half life. The point is the the toxin will be produced by the bacteria and is lethal to itself, until there is a antitoxin expressed somewhere in the genome to save itself. This provides a strong control over a variety of factors. The essence of this mechanism is most appreciated in maintenance of plasmids, population control etc. For example, the genome encodes toxin and plasmid encodes antitoxin. If plasmid is lost cell is dead. As can be seen there is a great deal of opportunity to create an antibiotic here. The point is the mechanism is excruciatingly simple. But there are a variety of molecules and operons involved in a singles system. If i remember it correct, a single bacterial cell can possess several sets of such systems. Based on the molecules involved, the mechanism of action, Toxin antitoxin (TAT) has been classified into 5 different class. Table 1: Classification of Toxin-Antitoxin system (TAT). With this background information and understanding, lets take a look at one example of how the system functions. For elaboration purpose, am citing the MazEF system of E coli. It is one of the best studied with sufficient data available to see the point. The MazEF system consists of MazF that encodes a stable toxin and MazE encoding a labile antitoxin which prevents the lethal effect of MazF. MazF has a sequence-specific ribonuclease activity toward single- or double-stranded RNA regions and the resulting degradation of cellular mRNA causes global translation inhibition. To be precise, action of MazF is to cleave at ACA site closely upstream of the AUG start codon of some specific mRNAs and thereby generating leaderless mRNAs. A true toxin indeed. The system is often referred as Programmed Cell Death (PCD), analogous to apoptosis in eukaryotic cells. Since the cells cannot be sustained without the antitoxin, the antitoxin is vaguely referred as "Addiction molecule". 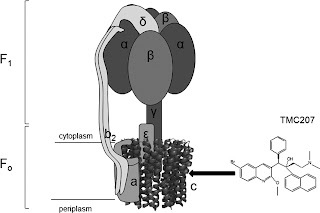 The MazEF system is linked to the quorum sensing system. Triggering of extra cellular death factor (EDF), which is a quorum-sensing pentapeptide NNWNN leads to cascade of events. zwf gene product (glucose-6-phosphate-dehydrogenase), carrying the amino acid sequence NNWDN is considered as the precursor of EDF. An explanation is the degradation product of the G6PD which can be expected in conditions of very low nutrition is the EDF (You can easily see the point). MazE is degraded by the ATP-dependent ClpAP serine protease in the cell. By increasing the degradation of MazE the inhibitory effect of MazE is removed and MazF is free to perform its action. The MazE can also be reduced by stress related response such as DNA damage, Antibiotics such as rifampicins etc. Moreover, MazF activation led to an increase in the production of EDF. This is the positive feedback loop. Overall point is that when cell is required to suicide for the benefit of others (Altruistic behavior), such as in harsh conditions the cell can increase the activity of MazF and kill itself. I have presented an illustration of this idea in Fig 3. This gives us a point of intervention. If we can design a chemical that can attack the antitoxin activity, the toxic activity of the MazF can be allowed to take over and kill the cell. The TAT system is usually very specific for a species, or a small group and hence specifically designed pharmacological compounds can be used, unlike the one's we use now which blindly attack many different bacteria including the normal flora. MazEF is not the only system in E coli. Other systems in E coli include chpBIK , relBE , yefM-yoeB and dinJ-yafQ systems. More and more studies are published in variety of bacteria showing similar systems, such as the most recently published PemIKSa system in S aureus. That brings me to an important question. What about resistance. Say, I develop a compound that can interfere with this system, most probably by the law of natural selection since there will be a clear evolution. Antibiotic resistance can be expected in this case also.